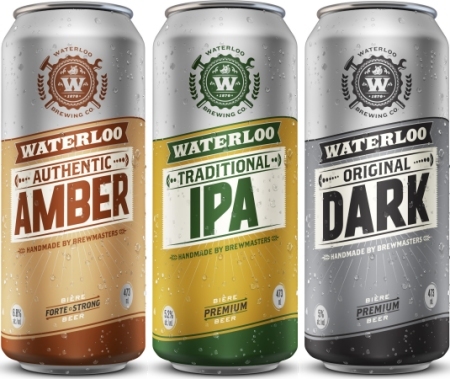 WATERLOO, ON – Brick Brewery is planning some changes for its Waterloo family of beers, including a new look for the brands, and the addition of a new beer to the line-up. At 5.2% alc. Waterloo IPA is brewed in the traditional English IPA style. Brewed with roasted malts and European and American hops delivers the body and bitterness you’d expect from an authentic India Pale Ale. Waterloo Premium Amber Lager is brewed with all-natural spring water, a special blend of five distinct malts and is brewed with hops from the renowned Hallertau region in Bavaria The beer is then aged with Northern White Oak giving it a distinct aroma and taste. A dark beer that is slowly brewed with Canadian grown malted barley, specialty coloured malts, imported hops and pure cultured brewers yeast, Waterloo Dark is for the beer drinker who likes a dark craft brewed beer without the filling heaviness. Waterloo IPA and the new cans of Amber and Dark will be available at select LCBO locations later this month.